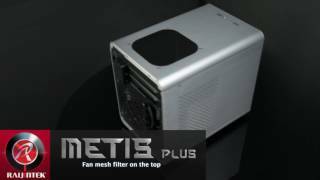 The Metis Plus - RAIJINTEK’s new aluminum MINI-ITX case. It is an upgraded version of METIS where pure innovation meets classic design. The Metis Plus - RAIJINTEK’s new aluminum MINI-ITX case. It is an upgraded version of METIS where pure innovation meets classic design. The Metis Plus is compatible with regular/standard ATX Power supplies, 170mm VGA cards and 160mm height CPU coolers. The Metis Plus comes with one 12025 O-type LED fan pre-installed at the rear and an option for a 120mm fan at the top. With an Aluminium hair-silk anodized appearance, and a side window to showcase your system, the Metis Plus is a worthy upgrade to the Metis for users who seek more functionality. - 12025 O-type LED fan pre-installed at rear. More links for "Metis Plus Aluminium Mini-ITX Case - Green Window"
"If you want a good-looking, truly tiny case for your mini-ITX system, and aren’t too fussed about having top-notch cooling or masses of features, the Metis Plus is a good choice, plus it’s good for modding." "As long as you're happy to make accommodations for this case in your choice of hardware (an SFX PSU and bracket with a short cable set spring to mind, as does ensuring you utilise M.2 ports as much as possible), we're confident you could build a pretty awesome rig into the Metis Plus – it certainly serves as a good advert for the Zotac GTX 1080 Mini, albeit inadvertently"
"Overall the Raijintek Metis Plus is one of the nicest looking ITX cases on the market and having such a good looking aluminium exterior really sells this case for me."